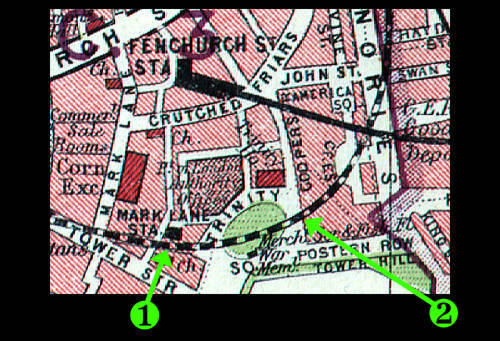 This station replaced the nearby Tower Of London station on the District/Circle lines. station was used for the new one. here to avoid confusion with the present Tower Hill station. 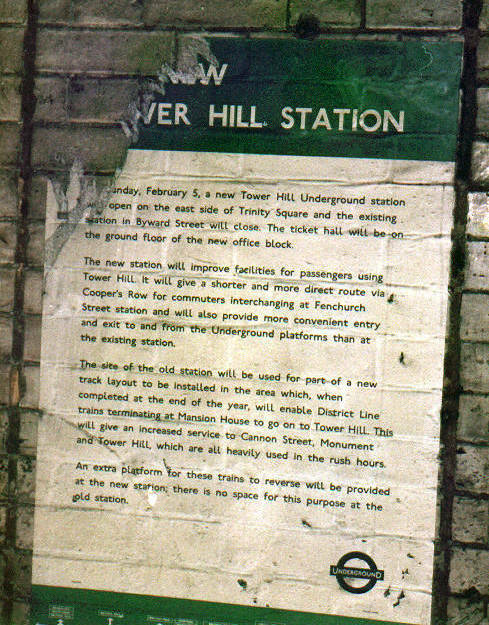 (2) The current site of its replacement, Tower Hill station. The eastbound platform looking eastwards from its western end. Eastbound platform, again looking eastwards. There are now three tracks in use here: the eastbound track, the track feeding the terminating platform at Tower Hill (formerly the westbound track), and the new westbound track built where the westbound platform at Mark Lane station used to be. The train in the photo is on the new westbound track. Same area as the photo above but closer to the staircase and with a much wider angled lens. The remaining platform and the staircase are still visible on the north side just before arriving at Tower Hill station. View of the staircase from where the westbound platform used to be (it was demolished to provide room for an extra track). Marvellous photo from June 2006 showing the time capsule qualities of disused underground stations. Being generally inaccessible and being of little use for anything else, disused stations can have a remarkable preservation. View of the westbound platform area as viewed from the replacement station. The left hand track is built on the platform area but the brickwork of the station is still visible. Southern entrance to the station (similar to the current Baker Street Circle line exit on the south side of Marylebone Road). This has now been reopened as a pedestrian subway under the road. The pedestrian subway that was originally part of the station. The security access door to the eastbound platform is visible at the end (with the red & white warning sign on it). The station building in Byward Street with the entrance arrowed. 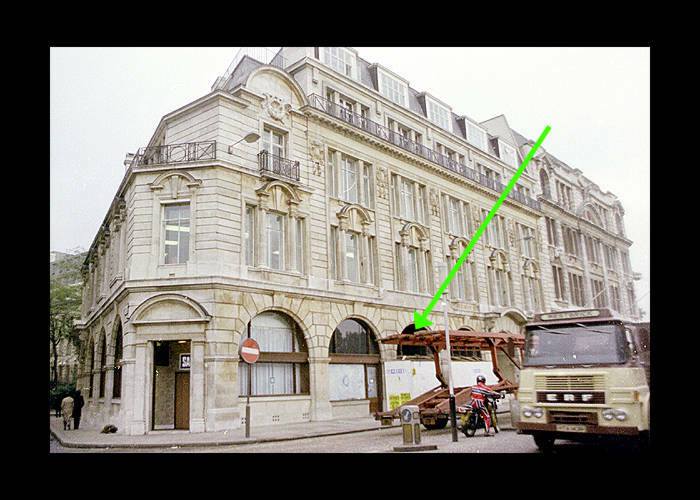 This photo, dating from the late-1970s/early-1980s shows the hoarding erected to cover the work being carried out to convert the original crossover walkway to a pedestrian subway. The subway is now separated from the platform area. As of Dec 2001, a soul-less All Bar One pub was opened on the site. To view a photo of the same building in September 2005, move your cursor over the image - note the extra top level addition on the left of the building. The arched entrance on the right lead to the Mark Lane Station Chambers. The interior. I don't suppose that is an original station clock but it seems incongruous with the rest of the decor and is perhaps the owner's nod to the origins of the building.